Fast broadband: Do you need it for gaming? Broadband speeds and gaming - do you need fast broadband for games? Do you need gaming broadband? Does fast broadband give better ping times? In the UK alone it's estimated there are more than 30m gamers, which accounts for a significant number of the total broadband subscribers. And broadband is a crucial part of gaming. Affordable and ubiquitous internet access has changed the way in which we acquire and play games, making it easier for gamers to access new titles and developers to distribute their work. The downside is that a satisfying experience can live or die on the quality of your connection, and those with slow or heavily restricted access will find it an increasingly difficult hobby to maintain. But is superfast broadband essential for gaming? And should keen players look for a specific gaming broadband service to get the best experience? When it comes to actually playing games online it is not necessary to have a very fast broadband service. Online gaming does not demand a huge amount of bandwidth so even a download speed of just a few megabits per second will be sufficient. 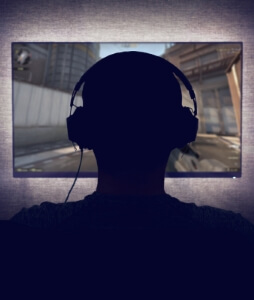 But while faster connections do not necessarily confer any huge advantage in an online match against other players, there is a good reason to get the quickest unlimited broadband package you can find - it's now impossible to be a gamer without frequent large downloads. How do you buy games? Digital game storefronts like Steam, PlayStation Network and Xbox Live are an enormously popular way to purchase games. Steam is especially busy with more than 125m active accounts, partly due to its famous sales which offer deeply discounted pricing. But game downloads can be massive, requiring hours to install even on rapid cable and fibre connections. That's problematic if your connection is slower than average, somewhat unstable or has a data usage cap. And there's often no alternative. You’d expect that going for a disc would save the time and bandwidth of a downloaded copy, except now it’s common for a physical purchase to involve a hefty download too. The boxed PC release of Grand Theft Auto 5 came on seven DVDs which could take hours to install, and even then required an additional 5GB patch. Batman Arkham Knight has an even bigger surprise in store for those who buy the PC DVD release: after installing five discs it still needs around 30GB of downloads. The fact is that no matter how you like to buy games you will need to download some big files at some point, whether it’s for a patch, DLC or just to complete a boxed installation. This is why we would always recommend that gamers opt for the fastest unlimited service they can afford. The unlimited part is particularly important as one single game download can exceed the monthly usage allowance of some cheap broadband packages, but a higher speed will also save you from waiting around too long. The current average broadband speed as reported by OFCOM is 36.2Mb. At that rate 30GB would take nearly two hours to download, while the 65GB of GTA5 could take almost four hours. Of course many people are on far slower connections; at the top ADSL download rate of 17Mb it would take more than eight hours to install GTA5. And remember that in practice your actual download speed may be much lower than the theoretical capabilities of the connection. ADSL will often deliver performance far below the stated 'up to' speed, and while cable and fibre broadband are generally better at providing something close to the quoted rates you'll also need to take into account the impact of other users - both in your home and elsewhere on the network - and the speed at which the download server can transmit data. All of this can result in much higher download times. You might see some broadband services advertised as gaming broadband, but it's not necessary to choose one of these packages for a good experience. If you're considering a gaming broadband provider look at what they're offering and compare it against other packages. They may boast of having unlimited downloads, static IP addresses and no traffic management but these are features you can find with many other ISPs, often for less money. You might also find other ISPs boast a greater variety of offers: Such as more deals with no setup fee; or a wider variety of broadband only packages (if broadband is all you're after). Another good reason to get a fast broadband service is if you're interested in live streaming games to Twitch and YouTube. This is an extremely demanding use of the upstream connection, and fibre optic broadband is significantly better suited to streaming than ADSL. With fibre you can get up to 20Mb upload, allowing you to stream HD quality video, compared to a theoretical maximum of just 1Mb on ADSL which is going to struggle with anything other than relatively low quality video. To find out more about upload speeds and streaming games read our guide to uploading. Many online games depend on a low latency connection. Latency, or 'ping', is measured in milliseconds (ms) and is the time it takes to send data and receive a response. When playing online it's the difference between a fun session and total frustration. Lag is a noticeable delay between your input and the game's reaction. It occurs when latency is high and can manifest in various unhelpful ways, perhaps making the game feel unresponsive or making it look like other players are teleporting. Lag can make fast paced titles unplayable. That’s particularly frustrating in competitive shooters like Call of Duty, Destiny and Counter-Strike which rely on accuracy and quick reactions. For fast moving games you ideally want a latency/ping under 100ms. They will generally remain playable at higher rates though lag can become very apparent at around 180ms, and many servers will automatically kick players who exceed a certain threshold (typically 200ms) to keep things smooth for everyone else. The good news is that fast broadband does not actually have much of an impact on lag. Latency is largely dependant on geographical distance from a server and the number of 'hops' (the servers between you and the destination). In the last Ofcom home broadband performance study tests on latency did show that fibre optic services of 38Mb and faster had slightly lower average ping times compared to ADSL, but the differences are so small that nobody except pro-gamers needs to worry about it. So long as your connection is able to achieve a speed of a few megabits you should be able to comfortably play online. One exception is satellite broadband. While it can now offer speeds in excess of a good ADSL2 line, satellite has a very high latency due to the time it takes to transfer data to and from the orbiting link and as such is generally unsuitable for online gaming, at least for anything which relies on fast reaction times. Lag is not necessarily something that can be blamed on a broadband provider. While you should speak to tech support if you feel the line is too slow it’s important to understand that playing an online game will involve sending data across different points which may be spread around the world, and delays could be introduced anywhere. Geographical location is important. The less distance data has to travel the lower your latency, so when selecting a game server choose the one closest to you. The options for each game will vary - there may be specific cities named or a server may cover an entire country or continent. If the game has a server browser it should indicate ping times - often colour coded - and offer various ways of filtering and sorting to find the most suitable match. Any reasonably popular title should have a choice of servers to suit everyone, though if it's an older game the selection may be more limited. Make sure you’re not hogging the connection with a lot of activity in the background such as automatic updates or P2P file sharing. This is particularly true for uploads as the upstream bandwidth of most home connections is far more limited than the download rate. This can be tricky if you’re sharing the connection, but then that’s where the added speed of fibre and cable also proves helpful. Handy as it is, Wi-Fi can introduce additional delays, instability and packet loss so if you’re trying to get the best online gaming experience we’d recommend plugging in an ethernet network cable to see if that makes a difference. If you’re far from the router a powerline networking kit is an easy way to extend wired coverage around the home. Is it lag or framerate? Sometimes a game may appear to be lagging when in fact you’re experiencing the effects of low Frames Per Second (FPS) caused by insufficient hardware or graphics settings that are too high for your computer. Play around with the settings to see if you can improve the FPS. It can help to use something like the Steam overlay to display FPS, and also search online for optimisation guides to help get the best performance from your system. Console players should not have to worry too much about this as the software should already be optimised, and console titles rarely have many options to tweak anyway.